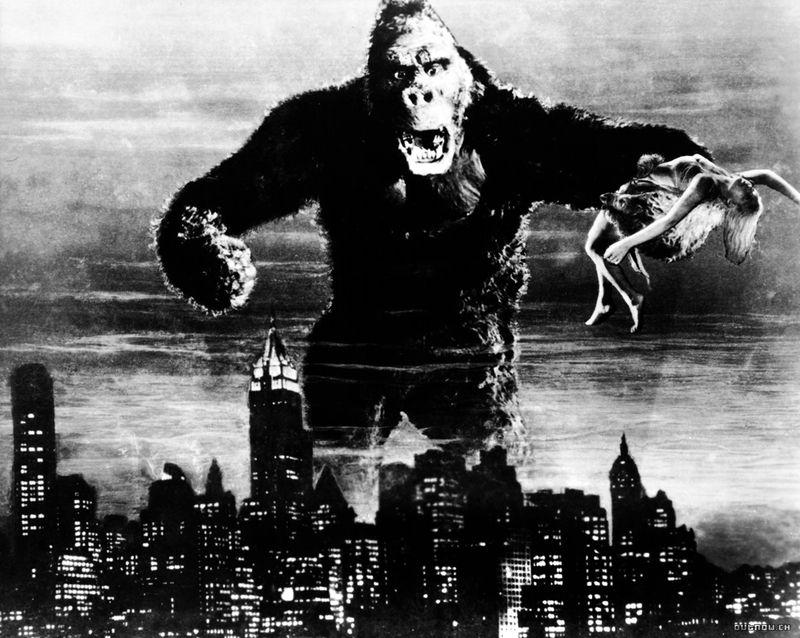 The original King Kong, released in 1933, is a movie classic in spite of itself. Few movies have dug themselves deeper into the public subconscious, yet, by any objective standard, few movies are as badly made: Its writing is infantile, its acting wooden. Even the special effects, so innovative in the day, are now the f/x equivalent of a stagecoach. King Kong may be the worst-made great movie of all time. It can make you cringe. Yet the film does keep us transfixed: It may be a badly written film on purely cinematic terms, but it’s a great movie nonetheless. Great enough to be No. 43 on the American Film Institute’s list of the 100 greatest American movies of all time. And the fact we’re still watching the original, now on DVD — to say nothing of remaking it over and over — proves that the first giant-monkey movie had legs like few others. One wonders whether Peter Jackson’s slicker 2005 version will last as long or be as deeply loved. The foggy gray and dangling lianas are the inner tangles of our brains, in 1933.
in 2005, there is a clarity to the visuals that diminish the Longinian sublime. Better? Maybe. The answer will come not from how well the film is made, nor how good its acting is or its special effects, but rather from whether the film engages us on a subconscious level: What is the movie really about? 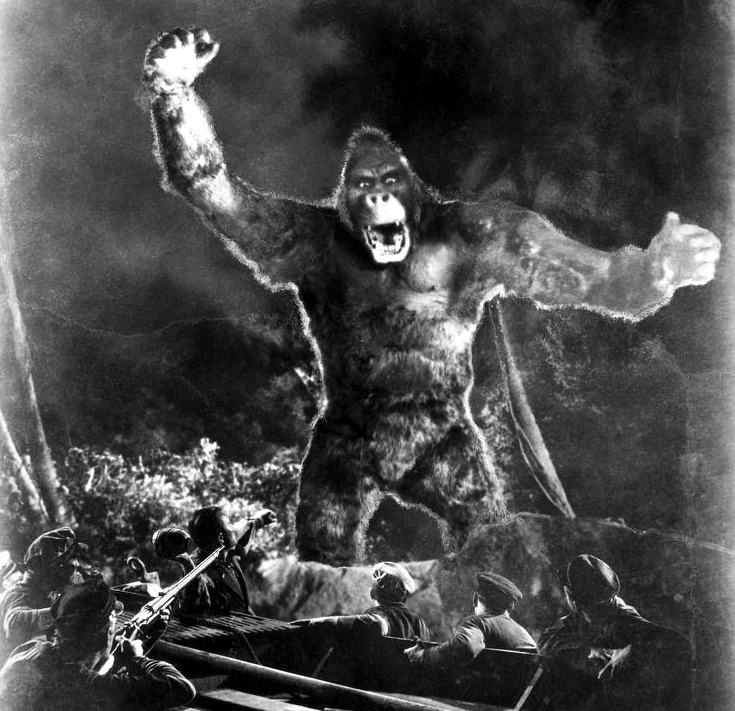 The original Kong has supported as many interpretations as it has had viewers. The movie itself makes a case for its being a modern Beauty and the Beast. But that’s only one subtext. For many young men who first saw the film on TV when they were adolescents, Kong is the personification of their own inchoate and newly hairy urges and unrequited loves. 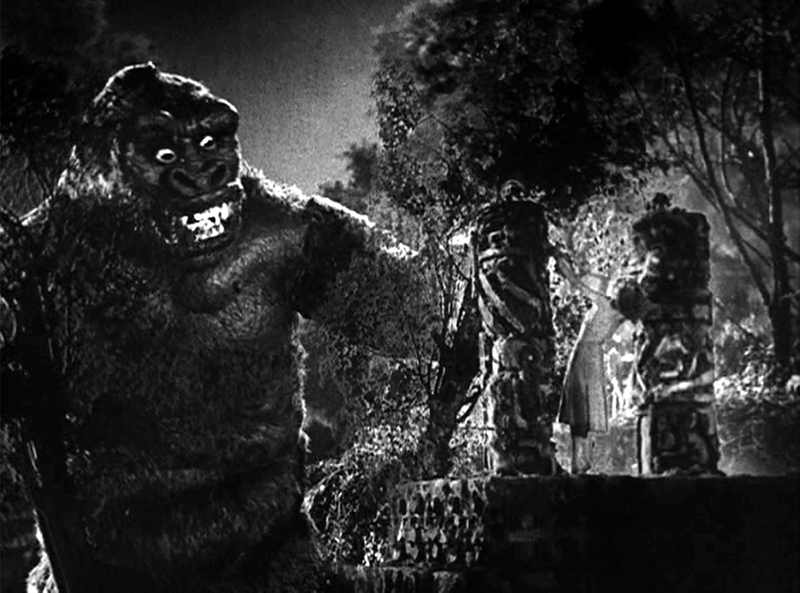 Kong as the great id. To paraphrase Walt Kelly: We have seen King Kong and he is us. There is also the Christ image of Kong onstage, crucified and manacled. But there are other meanings: For some, the movie is an allegory of slavery. The powerful king of the island trapped and brought to the New World in chains. Yet, we do enjoy the film. If Kong survives in our collective consciousness, it’s because of these more dreamlike realities, these irrational and atavistic persistences, and not because of its scant dramaturgical elegances. It speaks to our unconscious. Not our rational selves, but our dream selves. Kong speaks to us as myth. The impresario stands onstage in front of the giant ape. The poor beast, in his “chrome steel” chains, is both humiliated and confused. It is the fulcrum — the central point of the original movie between two unbalanced halves: the first in the jungle and the second, shorter half in the city. Two opposed halves with their different mythologies. Two different versions of nature that have been in conflict throughout history. One myth of nature is that of violence and survival. Nature, red in tooth and claw, where men venture at their peril. This is nature as the Big Thing, inside of which humankind is the little thing. Nature that inspires fear. Jaws. But at odds with this, in the old King Kong, is Rousseau’s vision of nature as innocent and pure, caught in a world made corrupt by the machinations of human beings. In this version, nature is the source of the unsullied good; human society the source of all that is evil. Kong is paradoxically both these visions at once: the powerful force of nature, but also the innocent caught in a world not of his making. It is not likely that Kong’s original makers, Merian C. Cooper, Edgar Wallace, Ernest Shoedsack or Willis O’Brien, ever had anything so profound in mind. They almost certainly just wanted to make a “swell picture” that would scare the willies out of us and make lots of money for RKO. But art is often better than its makers intended, and Kong is Exhibit A. This conflicted myth is the central power of the movie. The film manages to fuse both visions of man and nature into a single tragic image. 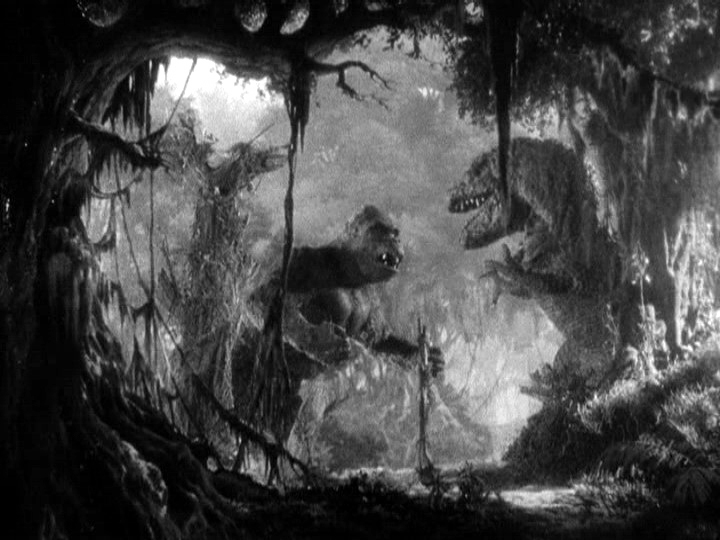 King Kong didn’t invent the basic plot: The silent film Lost World set the paradigm. But it, with its great unthinking dinosaur captured and brought to London, doesn’t give its beast the humanity that Kong gave the great ape. And the many followups, from The Giant Behemoth (ever seen a small behemoth?) or Gorgo don’t maintain the wattage of their ancestor. The bottom of the barrel may be Reptilicus. No, wait. That honor goes to the Dino De Laurentiis abomination, the 1976 remake of King Kong. The less said of it, the better. Jackson’s remake is infinitely more cinematic than either the original or the De Laurentiis monster, and Naomi Watts, in particular, is no-contest a better actress than Fay Wray. The newest film has its points. But it is too knowing, and can never quite scratch the mythological itch that Cooper and Schoedsack did. 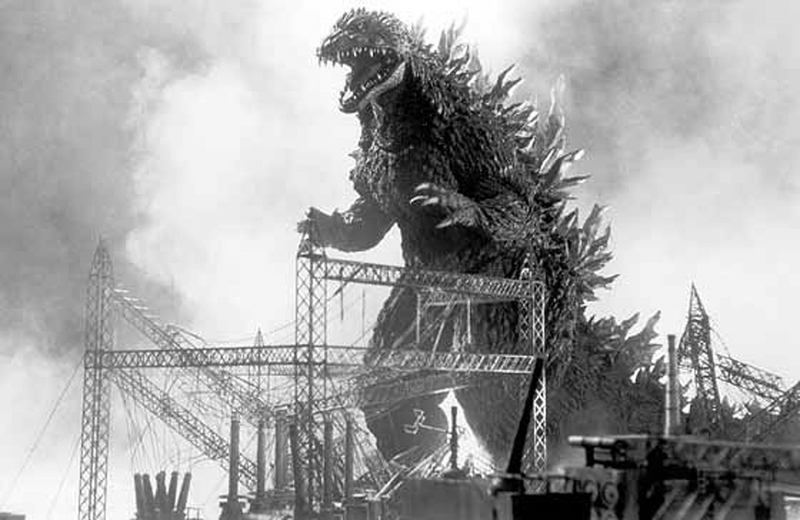 The only respectable colleague of the 1933 King Kong is the Japanese version of Godzilla (Gojira), which hits those low, plummy mythological notes, and maybe hits them a little closer to home, especially for those Japanese civilians who lived through the Second World War. As metaphor, Godzilla, with its brilliant, depressed score by Akira Ifukube, is as direct as parable. Everyone should see the original, sans Raymond Burr. The two films, Kong and Godzilla, show the power that may reside in popular entertainment that embodies deep myth. Modern filmmakers have it all over for style. But style isn’t what ultimately counts. Even badly made films can hit the bullseye. For that, the original is still king, and no pretender can claim the throne.